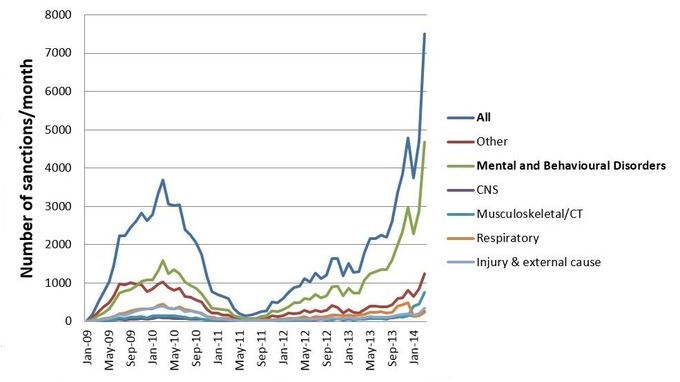 ESA sanctions ranked by disability: Notice that mental illness attracts by far the largest number of sanctions. Aren’t these the people who are most likely to commit suicide in such circumstances? Employment and Support Allowance is supposed to act as a safety net, to prevent Britain’s most vulnerable citizens from extreme levels of poverty. If you’re suffering from a mental illness, the safety net is filled with holes and suspended over a pit of sharks, each with Iain Duncan Smith’s face. The analogy is flippant, but the facts are anything but. The levels of distress that arbitrary sanctions can bring to people suffering from severe depression, anxiety, and eating and personality disorders are huge. To inflict this kind of stress on someone already struggling with a mental health problem is nothing short of barbaric, and yet the DWP continues to trample those who need help beneath its great, crushing wheel of incompetence and cruelty. Another stellar idea from the Department of Work and Pensions has been to station DWP employees in food banks, ostensibly help those seeking emergency food supplies to find work. Ironically, this is clear proof that Iain Duncan Smith is aware of the effects of his punitive measures. He knows that sanctions have forced more than a million people to rely on emergency food, and by placing DWP advisors in food banks, he is essentially making food banks an accepted part of social security in Britain. DWP – Department of Worriment and Persecution. The Department of Witch-hunts and Punishment have institutionalised disablism against those with MH problems, by instructions to Job Centre to exclude them from the rules governing the treatment of vulnerable. I wonder if there is any organisation that would be willing to take a test case on this, where the vulnerable claimant should get at least 2 face to face meetings with Job Centre staff before any sanctions can be applied, and whereby hardship payments are unlocked from day 1. Mind have done a good job publicising these figures, but I do wonder about the need to present it all in the context of those “found jobs”. Do you know what? I’ve been looking for a good alternative name for the DWP, practically since I started writing about it on this blog. “Department of Witch-hunts and Punishment” is perfect! Thank you very much! Those years of being a strange child who read the Thesaurus now have payback! This has to change. Write to your MP and then in small groups go and see your MP. Write to the local paper but even better, get on to the local council, or again with a small group go to the meetings and speak up. Ask questions and lobby for services not to be cut and get involved. We need everyone to turn this around. And we can make a difference! IDS has not only harmed people with MH issues, he and George Osborne has caused damaging anxiety to all other groups who rely on welfare and social housing. The Tory Government have created a fear so insidious that some people may never recover emotionally from the insecurity that has been created. Only 3rd world corrupt governments do that. Vampires in charge of the blood banks. Re putting dwp personel in food banks,thought that many users were actually in work!horrendous idea anyway,being bullied and spied on when having to go beg for food.humiliating enough. This move must be resisted. They cannot put their spies in the voluntary sector, it will destroy the vital trust. This man needs to be sent to prison he is much worse then most psychopathic killers? More comments on how IDS should be imprisoned/sectioned but no suggestions of how to achieve this. I have been damaged by JCP maladministration and deliberate misinformation and my doctors letter states that I am vulnerable yet the attacks continue relentlessly. So I am willing to get the ball rolling but who do I make the complaint to? The police? They won’t make a report even if you are physically attacked in front of witnesses and CCTV cameras. the JCP? I have had 3 special payments of £100 to compensate me for losses of over £25000 and a mental health breakdown caused by incorrect decision making. My MP? By the time I got an appointment and sent in my docs she had been voted out and the mailbox closed. So how do we stop this lunatic and his flu lies without an assassination? I think you nailed it in the last word there. After all, it’s a war that he started, and we’ve already taken thousands of casualties, so self-defence is perfectly justifiable. Of course IDS is proud he has done exactly what he was told to do, the outcome of his doing this won’t concern him at all because as we all know the tories only want “hardworking” people they are not in the slightest bit concerned about the sick and disabled or those unemployed because of loss of jobs and flooding of the jobs market.